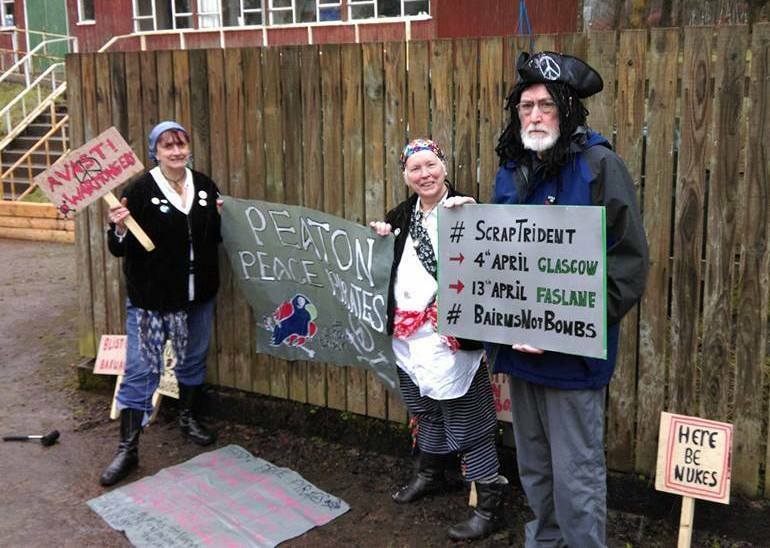 On Sunday, February 22, three Trident Ploughshares activists were arrested at Faslane naval base after attempting to paint peace slogans on the perimeter fence. 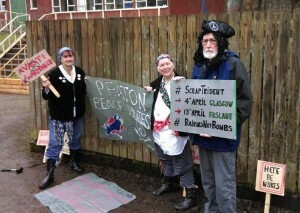 One person was charged with vandalism while the other two were detained after pinning a set of “Peace Pirate Articles” to the fence. 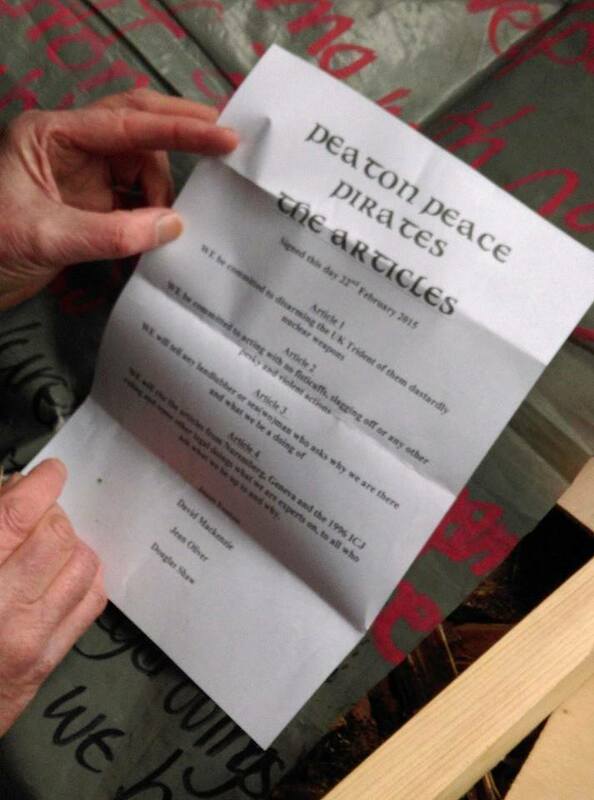 Jean Oliver, from Biggar, Janet Fenton from Edinburgh and David Mackenzie from Largs are known as the Peaton Peace Pirates (the “PPP”), and are careful to distinguish themselves from the sectarian splinter group known as the Peace Pirates From Peaton (the “PPFP”). Even-handed commentators will agree that these pretty slogans be a distinct improvement to this unmistakable blot on the moral landscape. We refer all observers and commentators to our Captain’s Articles, a copy of which we have attached to the fence, and which bind us to a code of honour, as among equals, and to the peaceful resolution of any disputes. We may be regarded by the authorities as mere scavengers of the seas, but it is these arsenals of vile weapons that are the real outlaws, in that they give, the swabs, an unjolly rogering to the universal code of humanity. But time there still be for the British fleet of state to go about and set an honest course for peace. Shiver me timbers! Ye landlubbers across these isles, the wind is set fair for ye to muster for parley, and see to it that the seven seas are scoured of this infamous devil’s curse. WE will cite the articles from Nuremberg, Geneva and the 1996 ICJ ruling and some other legal doings what we are experts on, to all who ask what we be up to and why.